Alessi has a wide range of high-end products made entirely in Italy, designed and created by hugely talented designers. From Moka Pot coffee makers to teaspoons, juicers, cups, kettles and milk jugs... Everything in the kitchen has been revisited by Alessi and their designers for the enjoyment of those who love elegant products and decor! 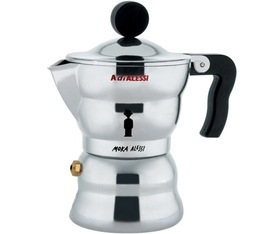 This Alessi 18/10 polished stainless steel 6-cup Neapolitan coffee maker was developed and designed by the designer Riccardo Dalisi. Free LUGAT coffee!